Traditional shepherd’s pie is comfort food at it’s finest, but when it gets a spice filled, cheese topped makeover it becomes comfort that’s off the charts. 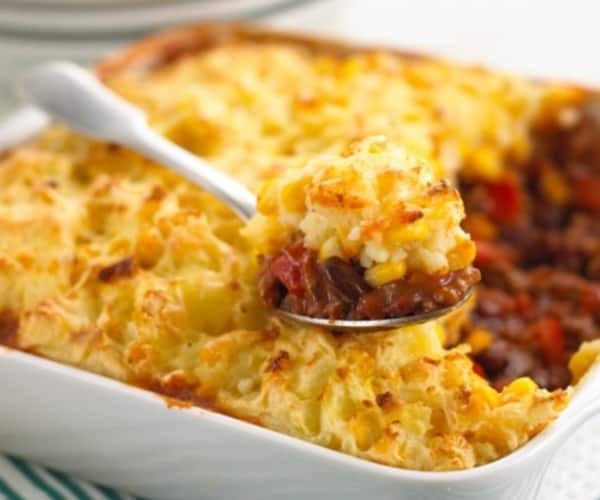 Mexican Shepherd’s Pie is a completely different flavor that makes a nice change from the usual fare. 1. Prepare mashed potatoes according to package directions. 2. Meanwhile, in a large skillet, cook beef and onion over medium heat until meat is no longer pink; drain. 3. Add the tomatoes, corn, olives, taco seasoning, chili powder, salt and garlic powder. Bring to a boil; cook and stir for 1-2 minutes. 4. Transfer to a greased 2½ quart baking dish. Top with ¾ cup cheese. 5. Spread mashed potatoes over the top; sprinkle with remaining cheese. 6. Bake, uncovered, at 350 degrees F for 12-15 minutes or until cheese is melted. 7. Serve with warmed tortilla chips.